Pope Francis has appointed two priests of the Diocese of Brooklyn – the Very Reverend James Massa, 54, and the Reverend Canon Witold Mroziewski, 49 – as auxiliary bishops of Brooklyn. Archbishop Carlo Maria Viganò, Apostolic Nuncio to the U.S., made the announcement public on Tuesday in Washington, D.C.
Bishop Nicholas DiMarzio will ordain the new bishops at a Mass of Episcopal Ordination at the Co-Cathedral of Saint Joseph, Prospect Heights, on Monday, July 20 at 2 p.m.
“These two men represent the very best of the diocese. One is a parish priest who, at heart, is a missionary, pouring himself out for others. 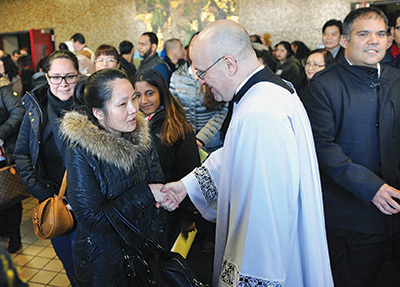 The other is a teacher, but in fact, very much a father to the young men of our diocese and beyond who are studying to be priests,” said Bishop DiMarzio. Father Massa was born in Jersey City, to the late Andrew and Irene Gilbert Massa. He attended Boston College and graduated with a bachelor’s in theology and history in 1982. In 1985, he earned a master’s of divinity degree from Yale University, and in 1997, a Ph.D. in systematic theology from Fordham University, where he wrote his dissertation under the late Cardinal Avery Dulles. The late Bishop Francis J. Mugavero ordained Father Massa a priest of the Diocese of Brooklyn on Oct. 25, 1986 at St. Teresa’s Church, Woodside. His first assignment was as a parochial vicar at Our Lady Queen of Martyrs, Forest Hills, 1986-90. He went on to serve as campus minister at Queens College, 1990-93, and in a number of positions at seminaries and universities as an associate professor of theology. In 2005, he was appointed the executive director of the United States Conference of Catholic Bishop’s Secretariat for Ecumenical and Interreligious Dialogue. He was appointed by Pope Benedict XVI in 2008 as a consultor to the Pontifical Council for Interreligious Dialogue and a member of the Joint Working Group between the Holy See and the World Council of Churches. Father Massa returned to the Diocese of Brooklyn in 2011 and coordinated the merger of the Theologates for the Archdiocese of New York, the Diocese of Rockville Centre and the Diocese of Brooklyn. In 2012, he was appointed associate professor of dogmatic theology and director of assessment and accreditation at St. Joseph’s Seminary, Dunwoodie. Since 2014, he has served as the Moderator of the Curia in the Diocese of Brooklyn, and recently served as administrator of Holy Name of Jesus Church, Park Slope. Father Mroziewski was born on March 25, 1966, to Waclawa Jablonska and the late Jan Edmund Mroziewski in Augustow, Poland. He earned a master’s in theology from the Catholic University in Lublin, Poland, in 1991. He returned to K.U.L., Poland, and earned a master’s in canon law, 2001, and a doctorate in canon law, 2003. Bishop Juliusz Paetz ordained Father Mroziewski a priest at the Cathedral of Lomza on June 29, 1991. He served as a parochial vicar in the parish of Kadzidlo. In 1992, he was sent for pastoral service in Brooklyn to minister to Polish ex-patriates. He was a parochial vicar at Our Lady of Czestochowa-St. Casimir, Sunset Park, 1993-2000, and served as pastor there from 2000 to 2013. 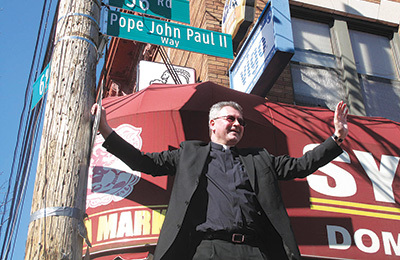 He currently serves as pastor of Holy Cross parish, Maspeth, since 2013. He is also associate promoter of justice for criminal cases and the defender of the bond on the Diocesan Tribunal. Reacting to the news of his appointment, Bishop-elect Mroziewski said, “I was told by the Apostolic Nuncio that I was appointed by His Holiness Pope Francis an auxiliary bishop to the Diocese of Brooklyn. At that time, I was shocked to the point of not saying anything. Soon, it came to my senses and my conscience what grace and honor I had received. “First of all, I give my humble thanks to His Holiness Pope Francis for selecting me and including me in the College of Bishops. My gratitude goes out to our diocesan bishop, Most Reverend Nicholas DiMarzio, for his trust in me, and his great example of dedication to apostolic service. “Thank you to all the bishops of our diocese, to our wonderful priests, religious and laity for their warm welcome given to me over 20 years ago when I came to continue my pastoral duties as a priest. Because of their constant openness, sincere collaboration, spiritual support and great gift of fraternity, this place became my home. 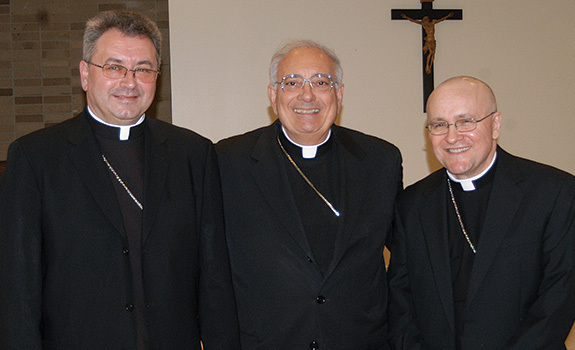 As auxiliary bishops, they will join Bishops Raymond Chappetto, Vicar General; Bishop Octavio Cisneros; and Bishop Paul Sanchez in assisting Bishop DiMarzio to serve the sacramental, spiritual and pastoral needs of the 1.5 million multi-cultural Catholics who reside in Brooklyn and Queens. My heart is overjoyed that Fr. Massa will be raised to an auxiliary bishop. He is a champion of the True Faith. God bless!